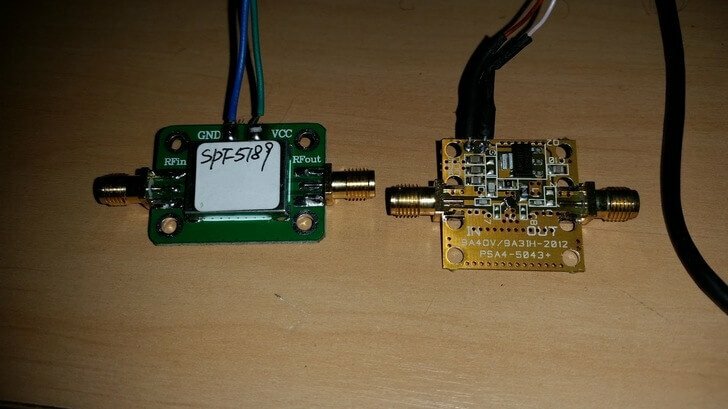 Over on his blog Lucas Teske has been comparing the LNA4ALL and an SPF5189 LNA from eBay on HRIT/LRIT reception from GOES satellites. SPF5189 LNA’s can be found on eBay for less than $8 USD, with free shipping from China, whereas the LNA4ALL costs 27 Euros shipped from Croatia. GOES is a geosynchronous orbit weather satellite which requires a satellite dish or other high gain antenna to receive. It downlinks at about 1.7 GHz, which means that a high quality LNA with low noise figure and good PCB design is needed for reception. In his post Lucas mentions how he saw a review on eBay stating that the SPF5189 did not work at L-band. However, he found that odd as all of his SPF5189 LNA’s seemed to work just fine with L-band reception. So he did a benchmark comparing the SPF5189 to the PSA5043+ based LNA4ALL which is known to work well on L-band. From his comparisons he found that the SPF5189 does indeed work well on L-band, and is comparable to the LNA4ALL. He concludes that the reviewer must have received a bad unit, or didn’t know what he was doing. Lucas also makes an important note regarding the PCB design of these LNA’s. Even though the SPF5189 and PSA5043 chips have similar specs, with LNA’s the design of the PCB is crucial, as a poor design can significantly degrade performance. With the LNA4ALL you can be sure that the design is good, although the SPF5189 LNA’s currently on eBay look to be designed okay as well. Though with some eBay sellers there is no guarantee that you will receive a good board. We note that we have seen some really poor designs for PSA5043 LNA’s out there as well. The difference is 1 dB lower SNR approximately and a lower 1.5 or 2 dB amplification in the SPF5189. But it seems that the shielding of the SPF5189 avoids unwanted weak peaks. In May the GOES-16 will be relocated definitively to 137ºW or 75ºW. KerberosSDR • Re: KSDR device is not working!